** so didn't plan to be such a J.Crew FanGirl in this outfit! chilly nights, rainy days & no humidity to speak of. 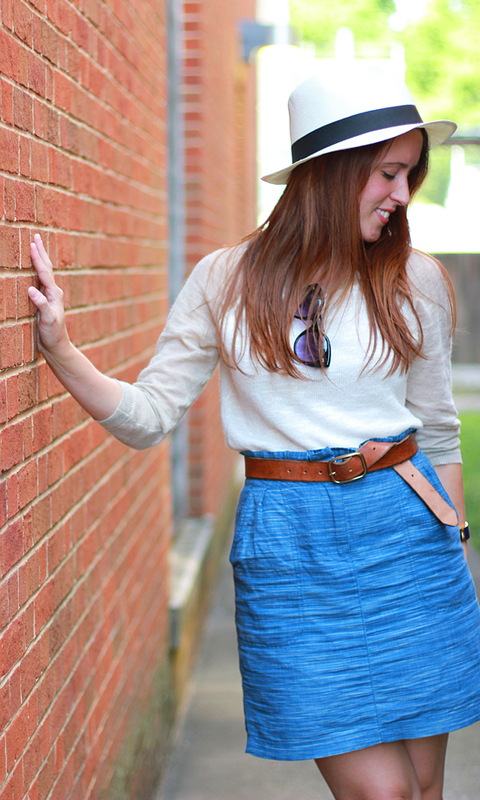 I found myself reaching over & over again for my light linen sweaters to pair with jeans, skirts, and thicker shorts. I don't know if Nashville will let me pull out layers again, but these light Summer sweaters will definitely be coming with me to Oregon next month! Do you get to rock Summer sweaters were you live? 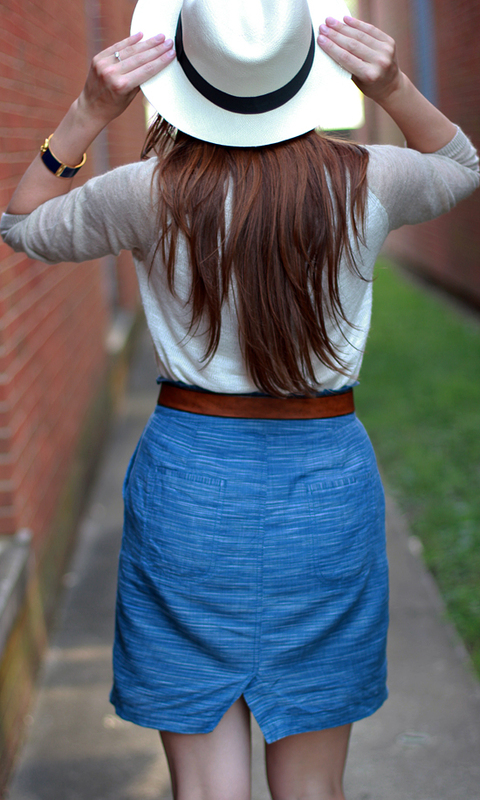 I love the belted skirt, I can never quite pull it off right! Sometime I can lie to myself and say it's cool enough out for a sweater but it never is. I need to just wait! This baseball tee is so adorable! 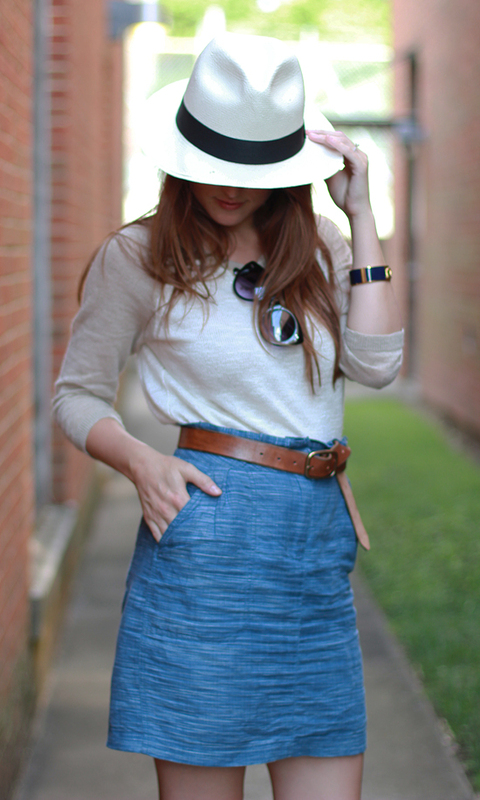 I love how you dressed it up a bit with the belted skirt! I wish we had a little cooler weather to break out a Summer sweater or two, but that has not happened this year! 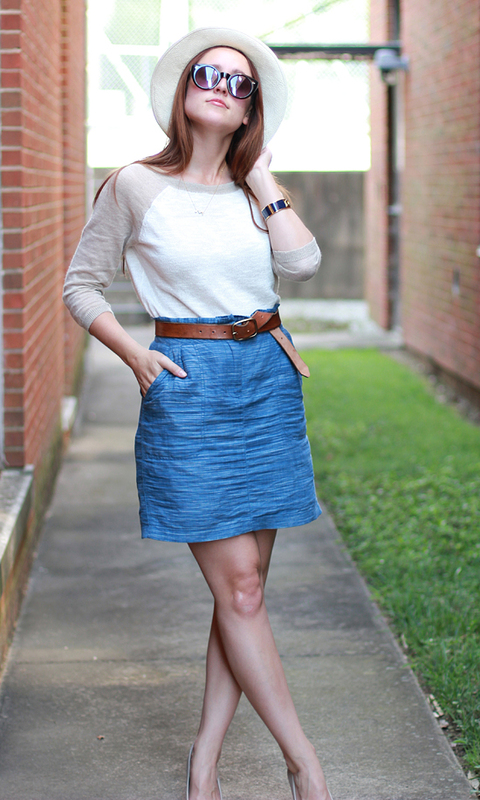 I love that skirt, you can wear it year round....it's so versatile! So cute and casual–I love this look on you! And that hat needs to come home with me ASAP! I used to work at a Talbot's in SA, TX years ago and never understood the concept of a summer sweater until I moved to the Midwest. I get it now and love it! You definitely need one! I am the Panama Hat's biggest fan girl right now! Pin & then recreate it! I loved that challenge so much! I tried so hard to snag this sweater during J Crew's 7 Days of Summer sale but it was all sold out in my size! I love the baseball tee look. WISH I could wear sweaters during the summer here but this year we've been over 100 more days than not! Ugh. This California beach girl is definitely NOT used to these desert summers (even after 9 years!). Love this look. That skirt is super cute! Very pretty - loving that skirt! eek! you look so fab, jessica!! I am in love with that skirt! It looks perfect for hot, southern summer days. We're dying in Atlanta also! Thank goodness it has rained so much lately. How do you take your pictures? Friend? or Tripod? The outside temps do not allow for summer sweaters, but it is freezing in my office, so I'm usually carrying a light cardigan with me. Love the hat! Oh no...definitely can't rock the sweaters...but I wish I could during the summer! This outfit is adorable!! Are you moving to Oregon or just visiting? I've been looking for the perfect baseball sweater/tee for months now -- such a great pick to carry from summer into fall! you'll definitely want to pack your summer sweaters for oregon, our nights can still be chilly! You're lucky you get to rock your summer sweater! It's not even possible for me here in NYC ;) Great skirt, hat, & wedges!! Just visiting for now. My fiancé is an Oregonian & we take a week each Summer to visit his family. This year's trip is extra exciting as we will be attending/participating in his twin sister's wedding! I can wear a summer sweater, but only at work (which is fine with me, I'm there 8 hours a day!). It's way too hot outside and in my apartment where the A/C doesn't reach every room, but my office is freezing. If I don't have a summer sweater I have a few emergency pashminas at work to keep from freezing. Love your wedges and that skirt is so pretty! I haven't been able to rock a summer sweater yet...but I have a few that are perfect when the weather is right! Love the baseball sweater and the skirt color. You look so cute in this outfit! Love the summer sweater & those sunnies! Light sweater options in the summer are so fun! Love this outfit. Light sweaters are great! I live right by the beach so it tends to be on the cooler side where I live so I tend to bring a cardigan or blazer everywhere I go. I'm a wuss when it comes to the cold.